Camden Isak was born on August 28, 2013, to a waiting room full of excited family! While labor was as typical as it can get, the next few hours were a time of confusion and worry. Camden was born with a fever and elevated respirations, and they immediately had to take him to the NICU to get an IV started. Dad got to go with him, but I was left by myself, in my post-delivery haze. Our family entered my room before Dad and Camden had returned, and I tried to explain what was going on. To this day, we will never really know, but they suspected that he had an infection. 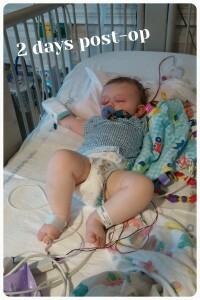 The three of us spent two weeks in the pediatric unit so he could receive IV antibiotics. He had more IVs than we could count, PICC line attempts, two lumbar punctures, and way too many heel pokes! Not exactly the start we envisioned, but it was toughening us up for what was to come. During the hospital stay, we saw countless nurses and the whole team of pediatricians from the practice we had chosen (a total of ten). I remember hearing a few comments about a crooked nose and a puffy eye, but everyone attributed that to delivery. Now we know those were probably the first signs of his craniosynostosis. We still wonder how EVERYONE missed it! We were at the pediatrician’s office A LOT in the beginning, as Camden was slow to gain weight. I remember his pediatrician mentioning something about his head shape. She said it was caused from the way he positioned himself, showed us a few things to encourage him to turn his head the other way, and that was that. When Camden was not quite two months old, we were referred to an occupational therapist for a wedge, since he had pretty severe acid reflux. She quickly commented on his head shape and after further evaluation, decided he had torticollis and plagiocephaly. It seemed things just kept piling on! Our baby just couldn’t catch a break! A recommendation was made for him to see a physical therapist. So we did. 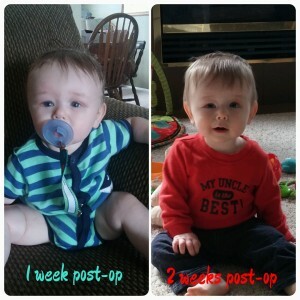 We did his daily exercises, and his range of motion quickly increased. But his head shape was not improving. I remember thinking that the pediatrician would say we should take the next step when I brought him to his next appointment. I knew this probably meant a helmet (she had briefly mentioned helmet therapy before). Sure enough, she referred us to the Craniofacial Clinic at Seattle Children’s Hospital. It was January 22, and Camden was now almost five months old. My husband had taken the day off to attend the appointment. We were pretty nervous, since we were sure they would recommend helmet therapy. The nurse practitioner briefly looked at Camden, felt his head, and then dropped the bomb. 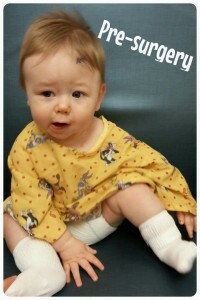 She told us that Camden had left unicoronal craniosynostosis and would need surgery. Cranio-what? Surgery? But we are here for a helmet! We were frozen. She stepped out to get some resources for us, and I remember telling my husband, “I can’t look at you right now or I will cry.” I did just that as soon as we got in the car. All of the sudden, a helmet seemed like nothing. 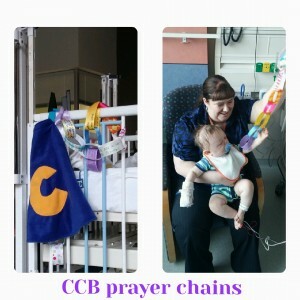 We had a follow-up appointment with our surgical team, and surgery was scheduled for June 3. It seemed like we would have to wait forever! The waiting was excruciating, although as surgery got closer, it seemed to come so quickly! Go figure, even after keeping ourselves cooped up the week prior to surgery, Camden got sick. I was on the phone with the hospital almost every day giving them updates on how he was. But we had pre-ops the day before surgery, and they gave us the green light. The morning of surgery, Cam was his normal happy, giggly self. He smiled at every person who walked into the room! I had played the moment where we would have to hand him over again and again in my mind, but when the time came, I felt nothing. I was numb. We had a huge support network at the hospital with us, including Shelby herself, and the time went way quicker than I thought was possible. We received periodic updates, and everything was going well. We had just received a call saying it would be another two hours or so, and then not 15 minutes later, we were told the doctor needed to see us. We were petrified. After waiting for what felt like forever, the plastic surgeon came around the corner and said they were done. We have never felt such relief! But again, we waited. 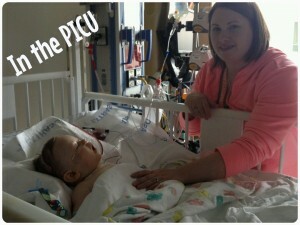 He was going to be transferred to the PICU, and then we would get to see him. The time went so slowly. We just wanted to see our little trooper! After realizing that our pager had stopped working, we finally headed over to see him. What a beautiful sight! He was having some trouble breathing, so people were in and out of the room. Dad had to head home since after the crazy, long day, he was starting to feel sick. He wasn’t able to return to see Camden because he ended up with a horrible cold and pink eye! The first night was really rough. They couldn’t seem to get his pain under control, and he didn’t stop crying until I got to hold him. He only spent one night in the PICU and then was transferred to the surgical floor where we stayed for another three days. 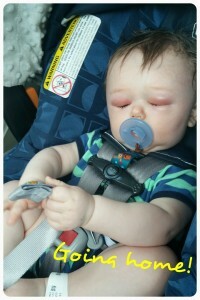 His poor little eyes swelled shut and he pretty much just wanted to sleep. Just as quickly as the swelling came on, it started to go down. Seeing those little slits of his eyes was so exciting! Even more exciting was hearing him laugh for the first time while we read his favorite book. Our whole journey was not one that we would have chosen, but we are so proud of our little cranio kid! We could not have made it without the support of our amazing family, friends, and of course, Cranio Care Bears!